Crop problems: look for the clues! 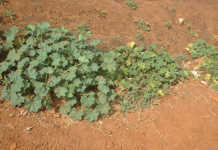 Home » Crops » Vegetables » Crop problems: look for the clues! We recently discussed how to identify mineral deficiencies and eelworm infestation. Many other problems can occur, of course. As already mentioned, the farmer is the best person to determine the causes because he has been with the crop from the start. Usually, the problem does not occur uniformly throughout the land and this is the starting point of an investigation. Most crops are sprayed with herbicide, and a mistake is often made in the measurement or calibration. Sometimes, the wrong product is used. Few herbicides eliminate all weed species and leave the crop totally unaffected. Where an area has been overdosed or double-sprayed, the crop will not grow as well as elsewhere on the land. Compare the difference in weed suppression between the two areas. 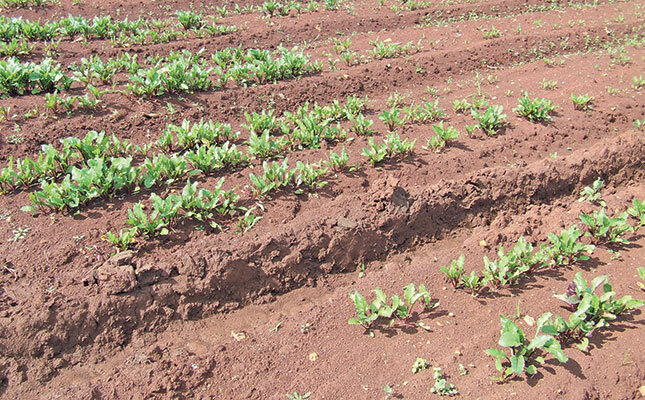 In the problem area, where the crop is struggling, you are unlikely to see weeds. Where the crop is growing well, you are almost certain to see weeds, but they will be sufficiently suppressed to allow the crop to flourish. Sometimes, the spray operator may start the sprayer a little late, leaving a small section unsprayed. This area normally matches the width of the spray boom. Healthy crop plants despite the weeds is another sign of over-spraying. The edges of the land can also provide clues about a problem. 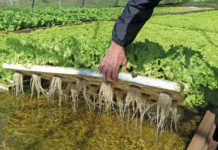 Invariably, the crop will not be planted right up to the edge of the land. In addition, when ploughing, the tractor operator sometimes allows the plough to creep a little into the edge, lowering eelworm populations. If the plants on the fringes of the land seem to be growing better than the rest, there’s a good chance you have an eelworm problem. In addition, the soil will have a higher organic content, retaining nitrogen better for a healthier soil life. It will be also be darker with fewer clods, indicating that more attention must be paid to this aspect. Whatever the problem, it must be thoroughly investigated to identify the reason for the difference in production. Whenever you come across a section where the crop is healthier and more productive, compare this section with the rest of the land, and calculate the difference in yield and the loss in economic terms by not having the entire land in this condition. A successful farmer is observant, but this seldom comes naturally; you have to train yourself to examine the crop closely and work out the cause for each difference you might detect. Often, you can produce a higher yield with the same input cost simply by identifying these differences and their causes. Although you might be in the best position to identify problems, it’s always a good idea to ask other farmers or company representatives for their opinion and compare notes until the reason becomes clear. If you’re truly stumped, take a soil sample from the ‘good area’ and one from the ‘bad’ and have them analysed. This should identify the source of the problem, which might simply be a matter of pH.